One of the important goals of „carbon-free“ technologies is the improvement of hydrogen cleansing membranes as well as hydrogen storage solutions. So far it is well known that Pd-Au alloys are able to absorb more hydrogen than pure palladium. However, the influence of gold on hydrogen solubility and its penetration into the bulk is not understood. This work looks into the absorption of hydrogen on surface alloys Pd-Au on top of Pd (110) using the techniques of therman desorption spectroscopy (TDS), hydrogen depth profiling with nuclear reaction analysis (NRA), angle-resolved photoemission spectroscopy (ARPES) as well as density functional theory. 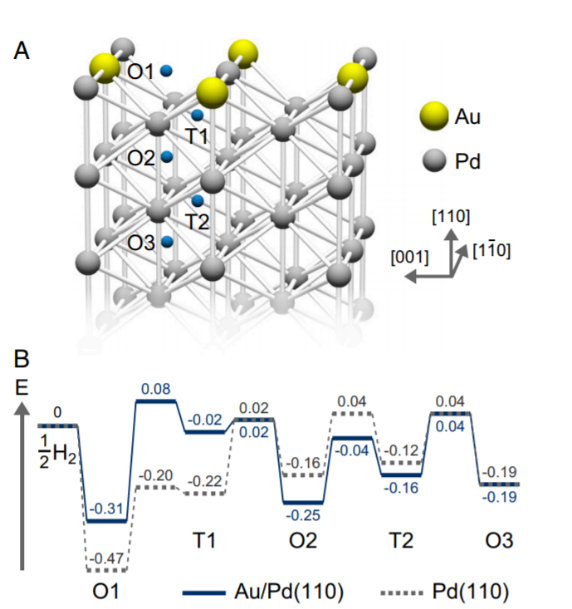 The papers shows that alloying the surface of Pd (110) with a sub-monolayer of Au dramatically accelerates hydrogen absorption.The degree of acceleration shows a volcano-shaped form against Au coverage. This enhancement of hydrogen kinetics can be explained by a reduced barrier of penetration which is caused by destabilizing the chemisorbed surface hydrogen, as supported by DFT calculations. 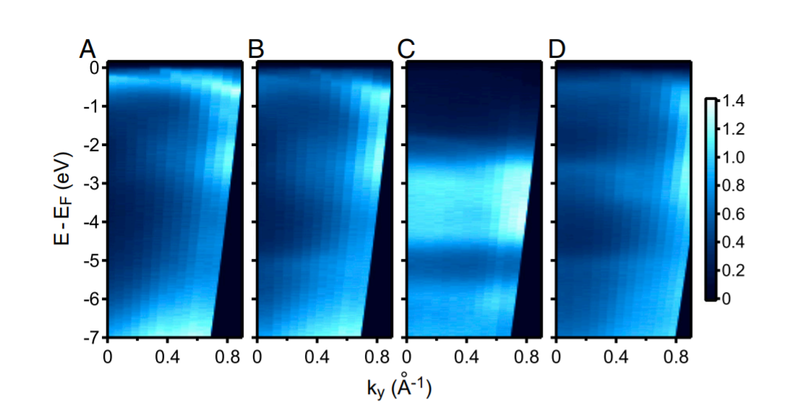 The destabilization of chemisorbed surface hydrogen is ascribed to the change of surface electron states which has been observed by ARPES: it is well-known that the position of d-bands with respect to the Fermi level is a good indicator of the adsorption energy of surface molecules. The shift of d-bands toward higher binding energies is correlated with the reduction of adsorption energy of hydrogen which has clearly been seen by thermal desorption spectroscopy. These findings can lead to a higher degree of control of hydrogen transport through Pd-based alloy surfaces as well as improve their selectivity and catalytic properties where adsorbed hydrogen in particular plays an important role. ARPES spectra as a function of wave vector and binding energy of electrons along the Γ–Y direction for (A) pure Pd(110), (B) annealed 0.48-ML Au/Pd(110), (C) untreated 2.4-ML Au/Pd(110), and (D) Pd70Au30(110) annealed at 600 K.